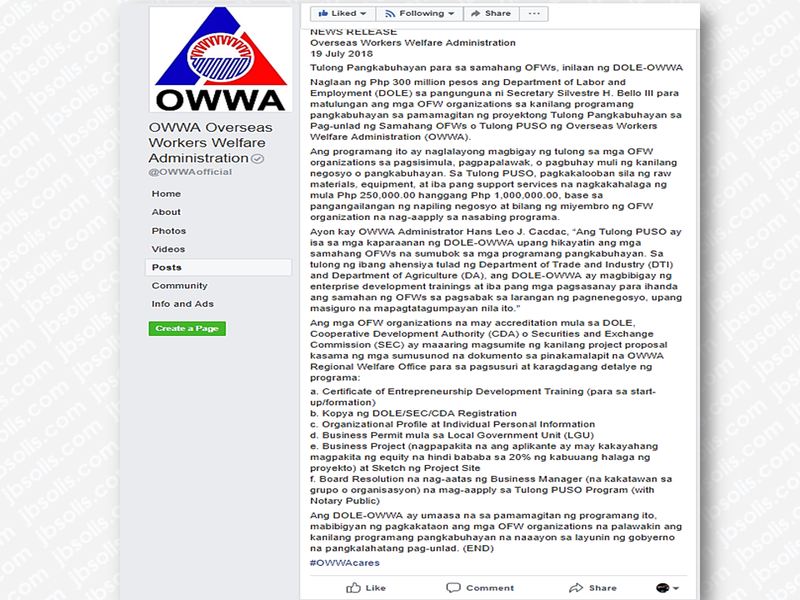 As a Philippine government agency, Overseas Workers Welfare Administration (OWWA) an attached agency of the Department of Labor and Employment (DOLE), is the lead government agency which protects and promote the welfare and well-being of Overseas Filipino Workers (OFWs) and their dependents. 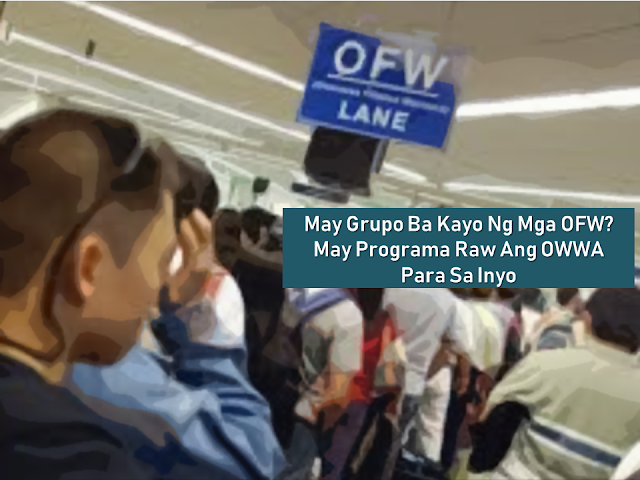 Over the years, it has formulated programs and projects that benefit OFWs. This time, a new program was launched which aims to provide assistance for OFW groups who want to put up a livelihood or businesses. 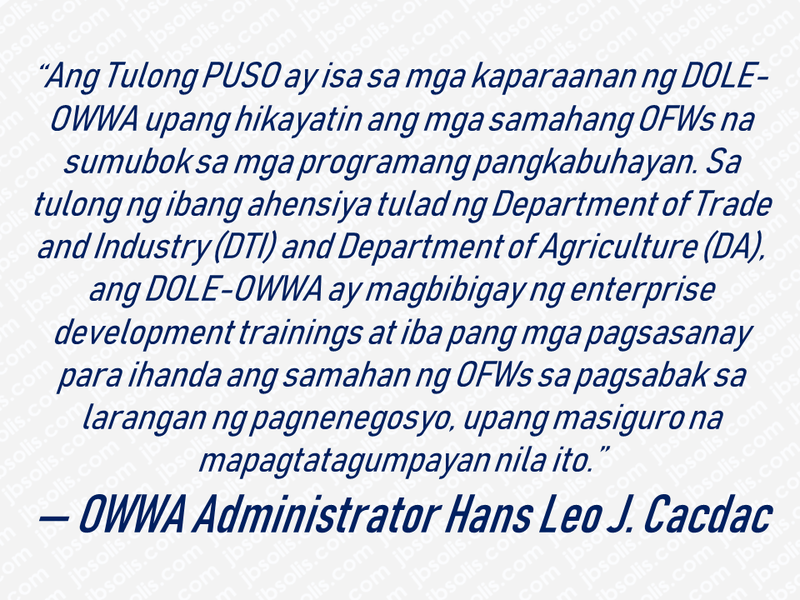 Through the project dubbed as "Tulong Pangkabuhayan para sa samahang OFWs" or 'Tulong PUSO", DOLE under the leadership of Secretary Silvestre H. Bello III together with OWWA has allocated Php300 million to help OFW organizations with their livelihood programs. The program is designed to assist the OFW organizations to start, develop or even to revive livelihood programs or businesses. Through the program, raw materials, equipment, and other support services which amount starting from Php250,000.00 up to Php1 Million depending on the requirements of their chosen business or livelihood will be provided by OWWA to the members of the OFW organizations. 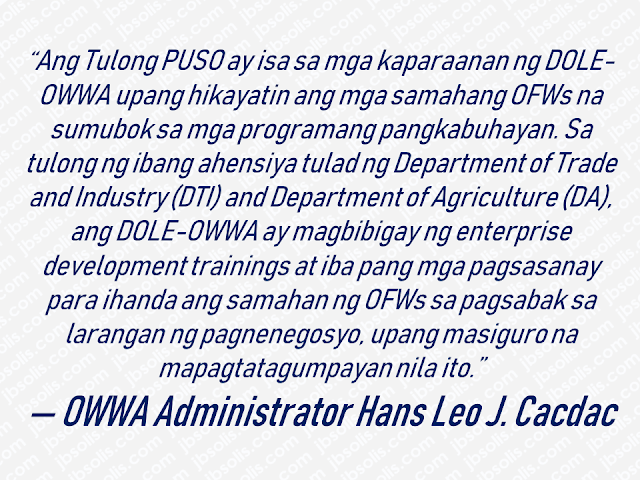 According to OWWA Administrator Hans Leo J. Cacdac, the program is developed to urge OFW organizations to venture into business and livelihood. OFW organizations with accreditation from DOLE, Cooperative Development Authority (CDA) or Securities and Exchange Commission (SEC) may submit their project proposal together with the requirements to any nearby OWWA Regional Welfare Offices for evaluation and additional details about the program. 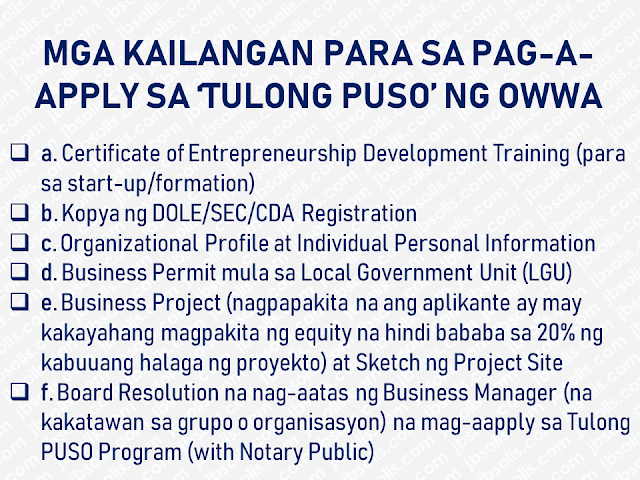 DOLE-OWWA is hoping that through this program, OFW organizations can have their chances to expand their livelihood programs in accordance with the government initiative for the benefit and progress of all citizen.